When you hear Madison Violet, the first thing you’ll notice is that their voices blend together, symbiotically, like family: born to sing the same songs. And over the past decade and a half, the pair have taken to genre-bending, moving effortlessly from folk to pop to electronic to Americana. In a word, they are musical chameleons. 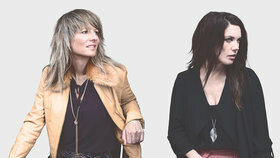 Over the years, Madison Violet have acquired quite a few accolades, including a Juno nomination, a Canadian Folk Music Award for Best Vocal Group Album of the Year and a Critic’s Choice award from Country Music People’s Magazine. Their songs have been featured in the notorious music magazine MOJO’s Top 10 Playlist, and received a mass of acclaim from outlets such as the BBC, the CBC, Maverick Magazine and NPR, and have earned the duo the Grand Prize in the 2010 Maxell John Lennon Song Writing Contest (which was voted on by a panel of distinguished artists including Elton John, Tim McGraw, Black Eyed Peas, Fergie, John Legend, Enrique Iglesias and Mary J. Blige).